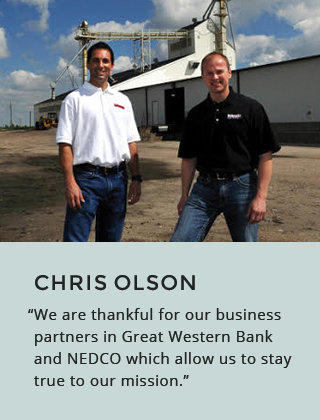 Cultivating a business can be a challenge, but for Nebraska Turf Products, Inc. teaming with NEDCO was the perfect opportunity for growth. Nebraska Turf Products, Inc. was started back in 2001 as a fertilizer sales company. Their first expansion came in 2007 when they purchased MAC Premium Products, a fertilizer manufacturing company. Taking this step has allowed them to both sell and manufacture fertilizer, and deliver products faster, giving them an upper hand against their competitors. 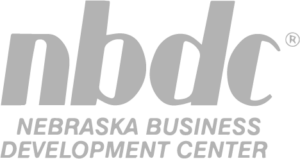 Chris Olson, owner at Nebraska Turf Products, Inc., found himself wanting to purchase a new building to increase retail exposure and get away from leasing. 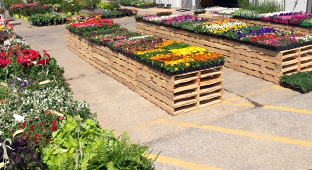 With the help of NEDCO and the 504 Loan Program, Chris was able to purchase a new location and expand the business to include mulch, sod, nursery stock, and annual flower sales. NEDCO was able to provide a loan that offered a low down payment, low interest rates, with a fixed rate for 20 years. This allows Nebraska Turf Products, Inc. to remove the variable of interest rate risk and make cash flow more predictable.